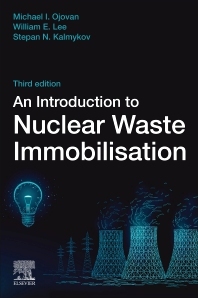 An Introduction to Nuclear Waste Immobilisation, Third Edition examines nuclear waste issues, including natural levels of radionuclides in the environment, the geological disposal of waste-forms, and their long-term behavior. It covers all-important aspects of processing and immobilization, including nuclear decay, regulations, new technologies and methods. The book has been updated to include a discussion of the disposal of nuclear waste from non-energy sources, also adding a chapter on the nuclear fuel cycle. Significant focus is given to the analysis of the various matrices used, especially cement and glass, with further discussion of other matrices, such as bitumen. The book's final chapter concentrates on the performance assessment of immobilizing materials and safety of disposal, providing a full range of resources needed to understand and correctly immobilize nuclear waste. Michael I. Ojovan has been Nuclear Engineer of International Atomic Energy Agency (IAEA), visiting Professor of Imperial College London, Associate Reader in Materials Science and Waste Immobilisation of the University of Sheffield, UK, and Leading Scientist of Radiochemistry Department of Lomonosov Moscow State University. M. Ojovan is Editorial Board Member of scientific journals: “Materials Degradation” (Nature Partner Journal), “International Journal of Corrosion”, “Science and Technology of Nuclear Installations”, “Journal of Nuclear Materials”, and Associate Editor of journal “Innovations in Corrosion and Materials Science”. He has published 12 monographs including the “Handbook of Advanced Radioactive Waste Conditioning Technologies” by Woodhead and three editions of “An Introduction to Nuclear Waste Immobilisation” by Elsevier – 2005, 2013 and 2019. He has founded and led the IAEA International Predisposal Network (IPN) and the IAEA International Project on Irradiated Graphite Processing (GRAPA). M. Ojovan is known for the connectivity-percolation theory of glass transition, Sheffield model (two-exponential equation) of viscosity of glasses and melts, condensed Rydberg matter, metallic and glass-composite materials for nuclear waste immobilisation, and self-sinking capsules to investigate Earth’ deep interior. Dr. Lee has been Co-Director of the Institute of Security Science and technology (ISST), Chair in Ceramic Science and Engineering, and President of the American Ceramic Society. Previous positions at Imperial include Director of the Centre for Nuclear Engineering, Director of the Centre for Doctoral Training in Nuclear Energy (with Cambridge and The Open Universities), and Director of the Centre for Advanced Structural Ceramics. He is a member of the Government advisory committee The Nuclear Innovation and Research Advisory Board (NIRAB), the Leverhulme Trust Panel of Advisors, the Royal Academy of Engineering International Activities Committee, and the Scientific and Environmental Advisory Board Tokamak Energy Ltd. He was from Jan 2006 to Sept 2010 Head of the Department of Materials. Bill was Deputy Chair of the Government advisory Committee on Radioactive Waste Management (CoRWM) from 2007-2013, has acted as special advisor nuclear to the House of Lords Science and Technology Committee (2013) and is an IAEA Technical Expert. He is a fellow of the Royal Academy of Engineering, IOMMM, ACerS and the City and Guilds Institute and a Freeman of the Armourers and Brasiers livery company.